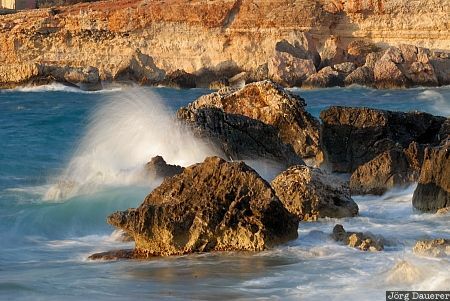 Waves crashing on the rocks of Paradise Bay. The motion of the water is made visible by a long exposure time. Paradise Bay is on the west coast of the Mediterranean island Malta. This photo was taken in the evening of a sunny day in March of 2009. This photo is part of the exhibition Water in Motion (October 2012). This photo was taken with a digital camera.